The Australian dollar has declined considerably from the recent highs (touching a 6-week low). But given the China slowdown and weakening domestic fundamentals in Australia, it may have room to fall further. Clearly relative to the rest of the developed markets nations, Australian economy is in decent shape, but is it good enough to justify the current AUD levels (1.0247)? Here are some reasons that show risks to the downside for the Australian currency. 1. Australia's sales for have been lackluster recently. 2. Construction seems to be slowing with building approvals down 11% YoY and new home sales down 5.6% for the month. 3. Exports have come under pressure with export growth coming in lower than expected last month. 4. Business and consumer credit growth has weakened somewhat as well. 5. There is also an expectation that the RBA (the central bank) will lower rates this year - which is not great for the currency. 6. 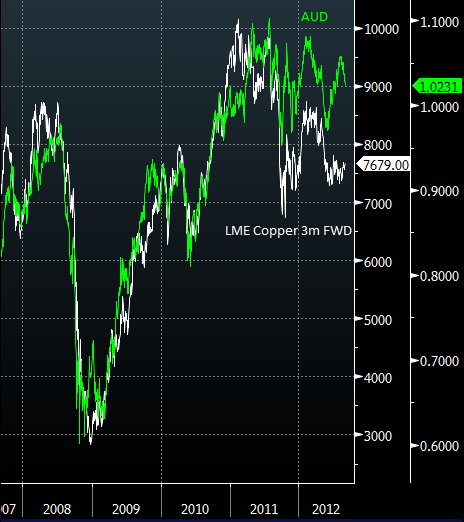 The most telling sign of potential further declines for AUD however is the following chart that compares AUD with copper prices. Given Australia's commodity driven boom of recent years, this divergence is quite telling.